either for use by till operators, or directly by clients. 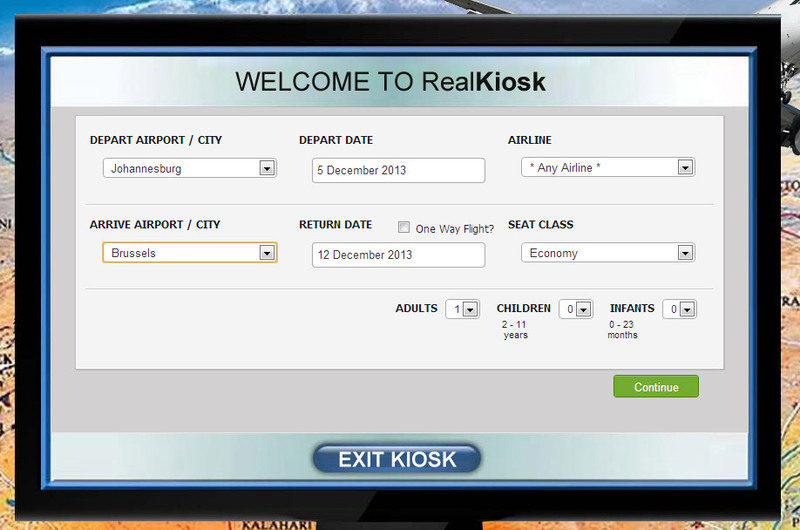 RealKiosk is a browser based web application that runs within a full screen browser. The RealKiosk can also be embedded within the client's own Point of Sale application. It is platform independent, light-weight, fast and it is easy to use, with little to no training needed for operators. 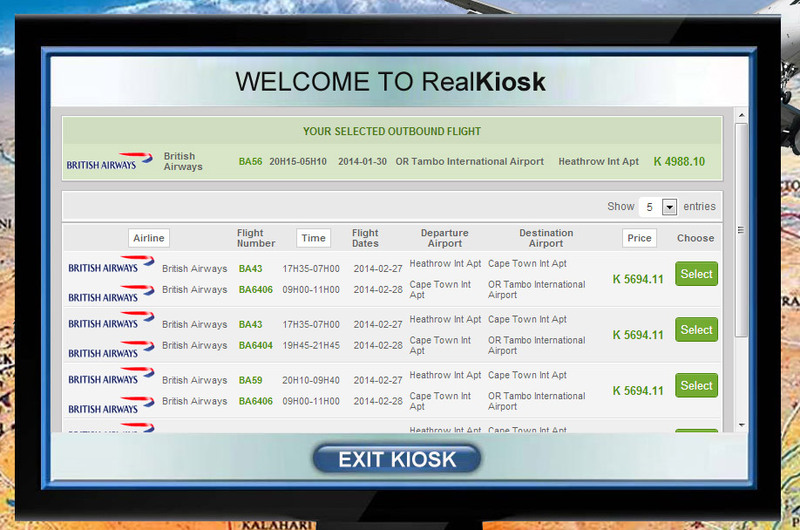 The aim of the RealKiosk is to do flight, hotel, car and bus searches and to make reservations easily. It also is quick to load and has low bandwidth usage to accommodate for slow internet connections in remote places. The RealKiosk interfaces to our XML API reservation engine, which allows communication between the kiosk and flight airline GDS, hotel vendor systems, car rental agencies and bus service providers. This gives your customer quick searching with best results. The point-of-sale operator can do travel searches, make reservations, do refunds, and indicate payment to the RealKiosk. Once booking is done and paid, our team of agents check the bookings and do electronic ticketing. The Kiosk system embeds the reservation info in such a way that the customer Point of Sale system can print a till slip with the booking reference information. The end users use till slips as proof of reservation to board flights, busses and for hotel stay or car rental. Our clients gain easy access into the travel product market. 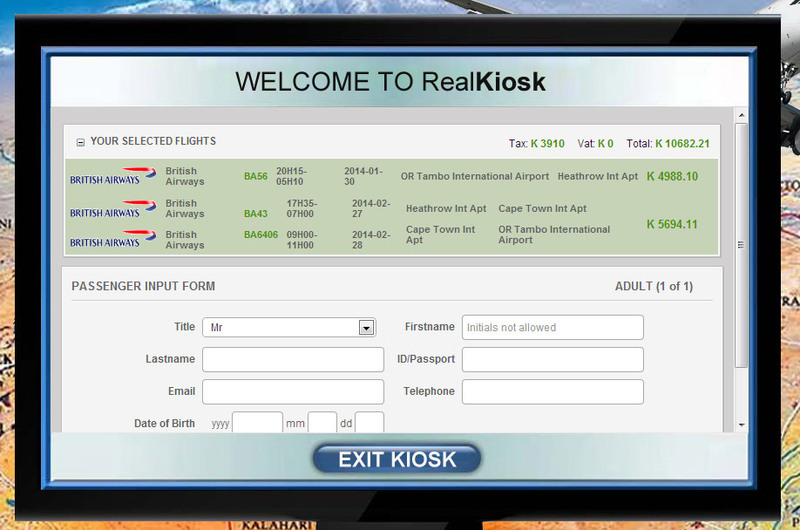 Even with limited knowledge on travel systems, our clients can provide travel products to end-users using the easy to use RealKiosk. Little to zero staff training required. By providing an easy to use human centric interface, the kiosk can be operated without prior training, making adoption into stores a smooth and easy process. Broad range of best-priced products. Customers attracted to well-priced travel products. Our customer can control product mark-up and profits. Since only a basic workstation setup capable of web browsing is required, installation of RealKiosk system is quick and painless. Systems can be up and running within days. Giving your customers ease of access to your product has never been easier. With RealMobi you are a mobi-click away from giving your customer the ultimate convenience of making on-the-go bookings anywhere, anytime. RealCorporate is a booking tool aimed at all corporate clients who want to have a better control over their companies travel spend and ensure company policy compliance. RealKiosk gives our clients the ability to provide kiosk point of sale terminals to their stores, either for use by till operators, or directly by clients. Our fields of expertise span across all aspects of travel technology, including the Internet, GDS and e-commerce strategies for travel companies. We lead at the edge of new innovations to bring you practical applications for your business. RealTime has supported the travel industry in South Africa since 1995 with an unrivalled combination of experience in travel products and technology. Our clients include the major tour operators and agencies operating out of JHB, CPT & DUR. TravelNet is both a fares database and an online booking engine. These two applications can be used together or independently to search, price and book flights, accommodation and car rentals. websites and networks for travel companies.